Date Calculator performs various calendar related calculations. It can display a calendar for any month of any year. Calculates the number of days between any two dates, optionally not counting certain days of the week, such as Saturday, Sunday, and user-defined holidays. It can also calculate the date X days before or after a given date. 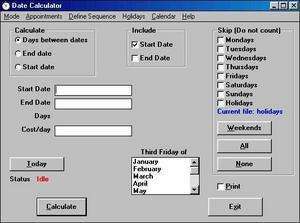 Date Calculator 7.3.0 is a shareware program and can be used as a demo to try the software until the free trial period has ended. A full version of the program is available after the trial period ends. For security reasons, you should also check out the Date Calculator download at LO4D.com which includes virus and malware tests. Additional screenshots of this application download may be available, too.